What makes Kevin's type of physiotherapy different? Over the years, many people have become disenchanted with physiotherapy treatment, particularly when attending musculo-skeletal physiotherapy departments in hospitals, on the NHS. Patients who attend the clinic to see our Nottingham physiotherapist complain of having to wait several weeks to get an appointment elsewhere on the NHS, and then when they get to see the Physiotherapist, they are just given exercises to do. Invariably these exercises don’t work for them, and they are still left with their pain. We are sorry to hear this, as so much more can be done to help, and although exercises are an integral part of muscle and joint rehabilitation, we don’t believe they should be given as treatment at the beginning of the physiotherapy treatment programme. Exercises are very important, but not until you’ve got the muscle (and often it’s muscle spasm that’s causing the problem) to relax off. What’s the point in trying to exercise a muscle that’s in spasm?! You know what’s going to happen if you do, don’t you? It’s going to get really upset, and really painful, potentially tearing more tight fibres, and probably going further into spasm, delaying recovery. Kevin is a 'traditional' physiotherapist. Treatment with Kevin will consist of heat therapy (very popular in the Clinic in the Winter. It’s just like having large hot water bottles on your back – very relaxing) deep tissue massage/sports massage, to help break down adhesions and scar tissue in the muscle fibres. 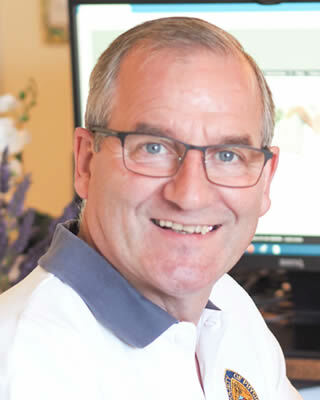 Kevin is highly skilled in mobilisations and adjustments of the spine, using osteopathic and chiropractic techniques. These techniques are aimed at releasing trapped nerves, muscle spasm and increasing blood flow. Acupuncture is used (but not essential) to facilitate the release of the body’s own pain-killing chemicals. Acupuncture is also used to treat and inactivate painful ‘trigger points’ in muscle tissue. These 'trigger points' create knots in muscle tissue, shortening the muscle fibres, reducing blood and oxygen. 'Trigger points' also irritate nerves in muscle tissue, causing muscle spasm (putting strain on joints) and pain. Ultrasound and electrotherapy are used to complement the treatments. again aimed at improving circulation, bringing fresh blood, oxygen and nutrients to tissues and, at the same time, removing 'toxins'. Treatment is aimed at restoring normal function as quickly as possible, and relieving pain.